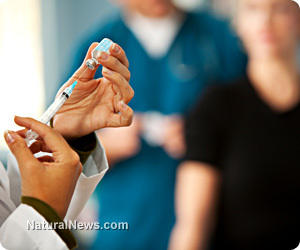 (NaturalNews) Oregon parents who choose to protect their children from the horrors of vaccines will now have to jump through a slew of unconstitutional government hoops, including subjecting themselves to state-coerced reeducation training and state-endorsed medical propaganda. This, thanks to the passage of a new bill recently signed into law by Oregon Governor and American traitor John Kitzhaber that makes opting out of vaccines more difficult. The bill, known as Senate Bill 132, admittedly aims to detract free-thinking parents from avoiding the public school system's vaccination requirements for their children. Currently in Oregon, parents can opt out of vaccines for both medical and religious reasons, and prior to the bill all they had to do was sign a simple form. Now, they will have to meet with a doctor or watch an "educational" video before being granted a waiver. "Parents who decline vaccines for their kids will have to visit a doctor or prove they watched an educational video before sending the children to school or daycare, under the new requirement that goes into effect immediately," explains a recent Associated Press (AP) announcement. "Previously, parents could seek non-medical exemptions by signing a form and citing a religious or system of beliefs." A direct swipe at parents' Fourth Amendment rights to not have their children's bodies seized by the government, this new vaccination exemption bill is a direct affront both to individual and religious liberty in the state of Oregon. The information to be presented to parents as part of the "educational video" requirement will reportedly come straight from the insanely biased U.S. Centers for Disease Control (CDC), which is nothing more than a mouthpiece for the vaccine industry. The same goes for the doctors to whom detracting parents will be sent. You can be sure that these conventional physicians will all follow the official government position on vaccines, which is that they are safe in every way and pose no side effects. Parents who have already made up their minds about vaccines will be forced to undergo a brainwashing session prepared for them by the government with taxpayer funds, which is completely unconstitutional. "It's inappropriate and unconstitutional to force a religious minority to seek a doctor's permission for something they don't believe in," stated Senator Tim Knopp, a Republican from Bend, following the passage of the bill. Knopp also expressed major concerns about the objectivity of the material that is to be presented to objecting parents. Though SB 132 still recognizes that parents have a God-given right to oppose vaccines, its intent is to chip away at this freedom by intimidating and brainwashing parents into simply complying. This is evidenced by the fact that many of the bill's proponents openly compared it to a similar bill passed in Washington state back in 2011 that successfully trimmed down the vaccination exemption rate by about 25 percent. "Not only are we stomping on First Amendment rights, the freedom of religion, but we are actually stomping on a right of a person to dictate their own health care," said Senator Fred Girod, a Republican from Stayton, about the implications of SB 132. "We are tromping on the rights of a parent to dictate what's best for their kids." The government can pass all the bills it wants, but the true test is whether or not such bills are constitutional, and whether or not free Americans will agree to abide by them. There is a constant war being waged against health freedom in this country, and parents everywhere need to start standing up and asserting their authority to choose their own health care, including their right to choose whether or not to have their children vaccinated.